BRANDON – Members of the Brandon University (BU) Department of Visual and Aboriginal Art and the BU Theatre Club are teaming up to launch a new exhibition at the Glen P. Sutherland Gallery of Fine Art. 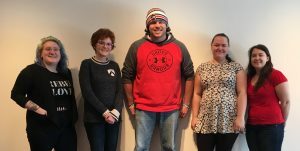 Members of the Brandon University Fine Arts Student Association, from left to right: Robyn Trenaman, Melanie Barnett, Darby Yakiwchuk, Rebecca Driedger, Victoria Seymour. Not pictured is Samantha Fortier. Coinciding with Brandon University Students’ Union (BUSU) Mental Health Week, the exhibition is titled “Drawing the Truth, Erasing Stigma: Understanding Mental Health.” The exhibition features student artworks that deal with issues surrounding mental health. Melanie Barnett, Chair of the Brandon University Fine Arts Student Association (BUFASA) says that the subject matter should make this exhibition particularly meaningful for both the artists and those who visit the Gallery. 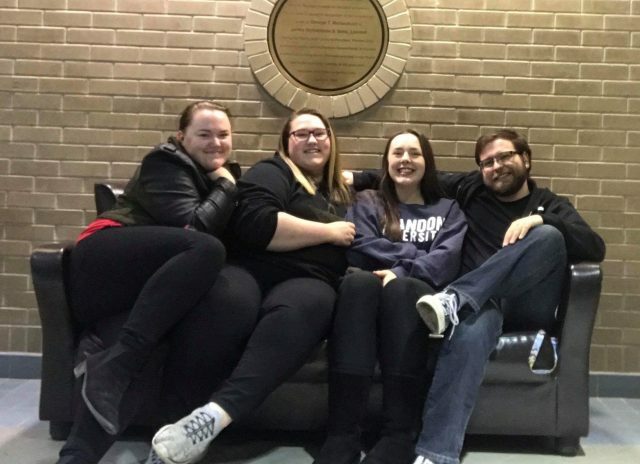 “In addition to BUFASA’s goal of creating opportunities to promote student work in a gallery setting, we hope that with this show will open up the conversation between students and the community, being a part of Brandon University Student Union’s Mental Health Week,” said BUFASA Chair Melanie Barnett. The opening reception, which will take place on Thursday, Feb. 1 at 7 p.m., will feature dramatic monologues throughout the evening. Members of the Brandon University Theatre Club, from left to right: Rebecca Driedger, Katie Brooks, Aurora Ouzts and Dakota Johnston. Not pictured is Jenna Bullee. Monologues at the opening reception will take place at 7:30, 7:50, 8:10 and 8:30 p.m. The exhibition will remain open until February 17. Hours at the Sutherland Gallery, located at 2021 Victoria Ave., are from 2 – 6 p.m. Tuesdays through Saturdays, and from 2 – 8 p.m. on Thursdays.